Meet the 3D printing company that might totally change how we manufacture, design, and even develop products. When you hear the words 3D printing, what do you imagine? Do you think about those cheesy, plastic parts? Desktop Metal has raised $270M to change all that. Unlike other metal 3D printers, which are ridiculously expensive, incredibly dangerous, and slow, their first product is a machine that will print metal parts on the desktop. And they’re about to launch a new production-level machine that will pump out parts as fast as using traditional manufacturing processes like casting and machining. The CEO Ric Fulop is an old buddy of mine from my days at MIT, so when I was visiting Boston a few weeks ago, I went to go visit and get a tour. And I sat down with Ric and two of his executives, Chief Technology Officer Jonah Meyerberg and Senior Software Engineer Andy Roberts, to learn more. We nerd out on their technology and what it means for the future of manufacturing. But what I was especially curious about is how metal 3D printing will change the game around what we make, and the way we design and innovate in the future. If you’ve been skeptical about additive manufacturing until now, this episode will change your mind. 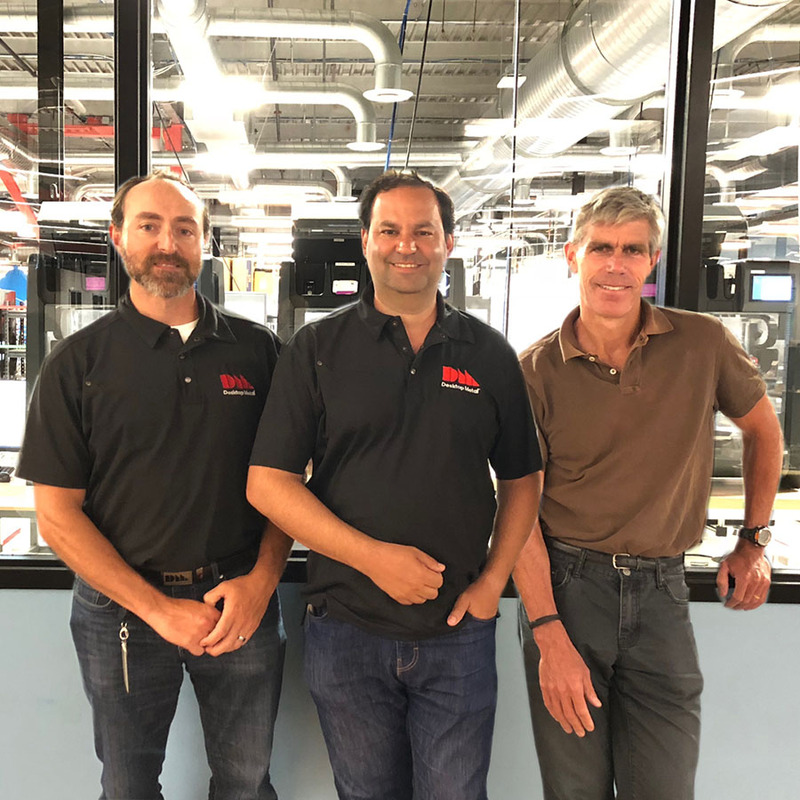 Ric Fulop is the CEO and founder of Desktop Metal, a company committed to accelerating the transformation of manufacturing with end-to-end metal 3D printing solutions. founded in 2015 by leaders in advanced manufacturing, materials science, and robotics, the company is addressing the unmet challenges of speed, cost, and quality to make metal 3D printing an essential tool for engineers and manufacturers around the world. Prior to founding Desktop Metal in October 2015, Ric was a General Partner at North Bridge, a VC fund with $3 billion under management, for five years following a fifteen-year career as an entrepreneur. He is the founder of six technology companies, including A123 Systems, Boston’s largest IPO in the past decade. At his departure, the company had a market capitalization over $1.5 billion and more than 1,800 employees. At North Bridge, Ric was an early stage investor and board member in Dyn (acquired by Oracle for $600 million), Onshape, MarkForged, Salsify, Lytro and Gridco. Ric led the North Bridge software and 3D investing practices. North Bridge was the original Series A investor in several of the companies that have changed the 3D and CAD/CAM landscape including SolidWorks (acquired by Dassault Systemes), ProtoLabs (NASDAQ: PRLB), SpaceClaim (acquired by Ansys) and Revit (acquired by Autodesk). Ric is a former Board Member of the Electric Drive Transportation Association and holds an MBA from the MIT Sloan School where he was a Sloan Fellow. Jonah Myerberg is a Co-founder and Chief Technology Officer at Desktop Metal, a company committed to accelerating the transformation of manufacturing with end-to-end metal 3D printing solutions. As CTO, Myerberg is responsible for leading the vision and direction of Desktop Metal’s 3D printing solutions. His duties include translating the technology behind the company’s metal 3D printing systems into reliable parts for customers, and identifying opportunities to expand manufacturing capabilities through additive manufacturing. Prior to joining Desktop Metal in 2015, Myerberg held senior positions with a variety of organizations focused on battery development and performance, including Renovo Motors and Boston Impact, which he founded, and A123Systems. At A123Systems, Myerberg established a new business unit focused on the development of high performance batteries. His team designed a new high performance cell for Formula One, as well as number of automotive partners. Additionally, he helped launch Gradiant Corp., where he managed the deployment and operation of large scale water desalination plants that converted fracking water into fresh water. Myerberg also held engineering and product development roles at both Bose and Black & Decker. Myerberg earned his B.S. in Mechanical Engineering from Lehigh University and his M.S. in Mechanical Engineering and Manufacturing from Johns Hopkins University. Andy Roberts, a software engineer, is the inventor of Live Parts ™ and is spearheading the development of this new generative design tool that uses morphogenetic principles to enable engineers and designers to quickly realize the benefits of additive manufacturing, including material and cost efficiency, and design flexibility. A graduate of Harvard University and Massachusetts Institute of Technology with extensive experience at leading technology innovators such as Parametric Technology Corp., Ab Initio, Azuki Systems and IBM, Andy has a proven track record of bringing to market successful products for engineers and developers.